Google Groups is one of the services that would benefit a lot from an integration with Google Calendar, Google Docs, Google Sites and other Google apps. It makes sense to create a document and to collaborate with other group members or to create a calendar and share it with your group. Google blog announced that the integration is already available. "As an example, imagine you're organizing a local intramural softball team tournament. You use Google Docs to keep track of the rosters for each team as well as each team's performance. You want all the players, but only the players, to have editing access. You already have a Google Group set up with the tournament participants, so you simply share the spreadsheet with the group itself, granting the group members permission to edit." To share a document, a calendar or a site, use the group's email address (groupname@googlegroups.com) in the sharing dialog. And if you want to unsubscribe from a group, Gmail makes it easier by adding an "unsubscribe" option when you click on "show options". *sigh* I was all excited when I saw this pop-up in my RSS reader that Google finally *FINALLY* added Google Groups (http://groups.google.com/) to the Google Apps suite. Allowing you to share docs with a group of users instead of individually is really just a feature that should have existed from the start. Come on Google, where's the Groups love? Don't you see how easily groups would fill one of the big Public Folder voids for would be MS Exchange switchers? Does it mean people in Google Groups don't need to have a "Google Account" or a "Google Apps Account" to sign-in? 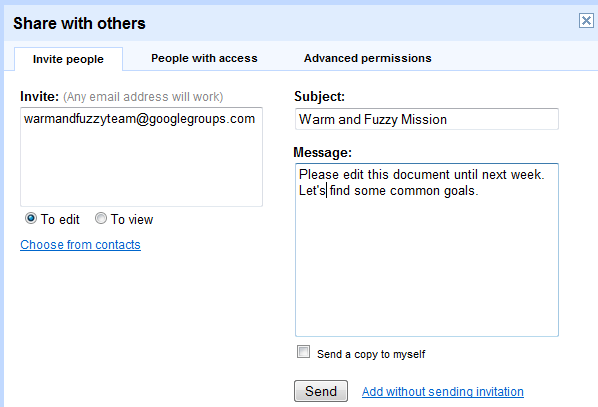 Or does it only mean that invites to get an account will be mailed to all in the Google Group? To use Google Groups, you need a Google Account. If someone invites the members of a group to edit a document, they'll be able to access the document if they sign in using the same account used for Google Groups. No not at all. A member of a Google Group don't need a Google Account. I thought everyone knows that, especially one that has a blog about Google. Google Groups often acts as a email list, only requiring a email address to send out mails. I don't understand why anyone would upload their sensitive documents to an online app. All security that you had before that is now gone. People break into online systems everyday just for fun. Others do it for profit and others might use the info to over-through a country. Have you all lost your minds? Google Docs Recently made it possible to also share documents/presentations (it was already possible for spreadsheets) - without the need to sign in! - this will also allow Google Group users that don't have a Google Account to access the documents shared with the Google Group. Of course the user sharing the document should take care the necessary options are set to allow this... (unfortunately Google Docs fails guiding users to set such required options). And yes, Anonymous, sharing without the need to sign in does not protect a document from being (ab)used outside to group of users that were originally invited. So one could call this one of those typical Google Docs workarounds. Google now claims that all members of a Google Group can view and edit Google Docs and Calender events, but my experience says this is not true. I have followed the instructions to allow the Google Group to view and edit both Docs and Calender events to find that the user must then sign up for a Google account. Once this is done, the user then has to send you a "request" to have access. In fact, the calender invitation provides a shortened link to click on to view the calender that does not even work. Since it is shortened, copying and pasting is not even an option. This is NOTHING like what the directions say is going to happen, am I missing something?